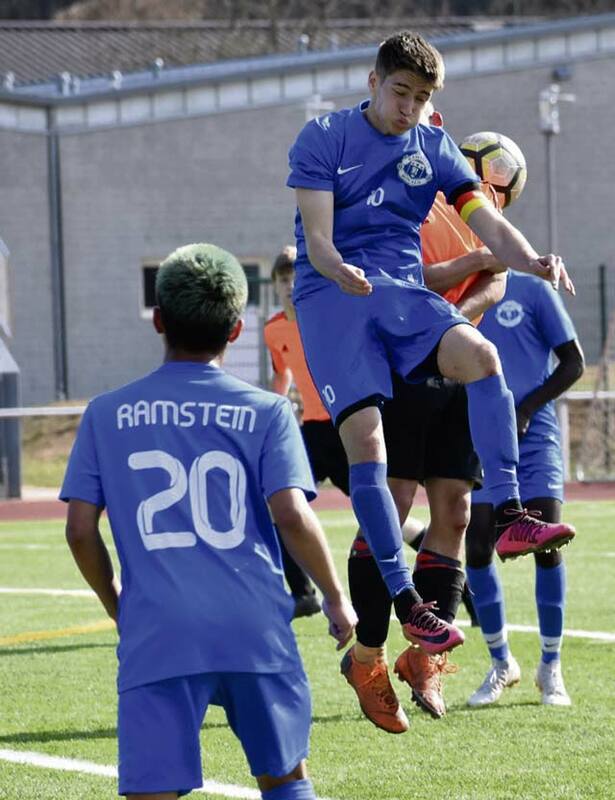 Jaden Buelvas booted two goals to lead the Ramstein boys soccer team to a 3-0 shutout of visiting Spangdahlem Saturday on Kaiserslautern’s field. The girls team got a hat trick from freshman Gabby Pace and strong leadership from its veterans to beat the Sentinels 7-0. After dropping its game to Stuttgart last week, Ramstein girls head Coach Katina Campbell decided they needed a new look and shook up the lineup. She placed attackers Rocio Fernandez at midfield and Haley Diome on defense. She felt that Stuttgart’s speed did the Royals in and Campbell did not want a repeat of that against Spangdahlem. She also was not happy with a lack of communication on the field. Against Spangdahlem, Campbell also had to compensate for the absence of the usual starting goalie, Morgan Lewis, replacing her with Kristene Merrill. The moves all worked. Fernandez is one of the best players in the league and controlled the action in the middle. Diome is a natural leader no matter where she plays. Merrill was perfect but probably the loneliest person on the field as Spangdahlem rarely had the chance to cross midfield. “They played today better than they have been playing,” Campbell said. Besides Pace’s three goal hat trick, the Royals got additional scoring from Brynne Beauchan, Allie Davis, and Alexis Tri. Deome also added a score on a penalty kick. In the boys game, the Royals 3-0 victory kept their shutout streak intact but they had to work hard for it against an athetic Spangdahlem squad. Ramstein has outscored its opponents 11-0 this spring. The Ramstein coaching staff knew that Spangdahlem was bringing the element of speed to the contest and they were aware at the Sentinels athleticism, for which they prepared throughout the week. The Sentinels forwards were active and posed problems for the Royals defenders. 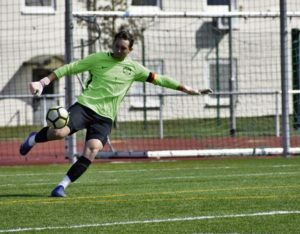 Ramstein’s disciplined defenders did what they could to make it difficult for them to get the ball, but when they did break the Ramstein defenses, they were stonewalled by outstanding senior goalkeeper Garrett Erickson, who will be playing college soccer in the USA next season. The game was scoreless early with neither team able to capitalize on breaks. About halfway through the first half, Buelvas outsprinted the Spangdahlem sweeper and blasted a right footed shot low and to the left of the keeper for the first goal. It was 1-0 at halftime. In the second half, Ramstein tightened the reins on the active Spangdahlem attackers and the Royals were more aggressive in their own scoring zone. They got number two when Dieter Messner scored from close in. Buelvas scored again late for the 3-0 margin. Ramstein will return to action on Friday, April 19, when it hosts Lakenheath at Kaiserslautern. It travels to Wiesbaden on Saturday April 20.